Apex Lodge and Charters was built from the ground up by Shane Ring, Ephraim Lohrey, and a small team of helping hands. It’s scheduled to open later this year in June. 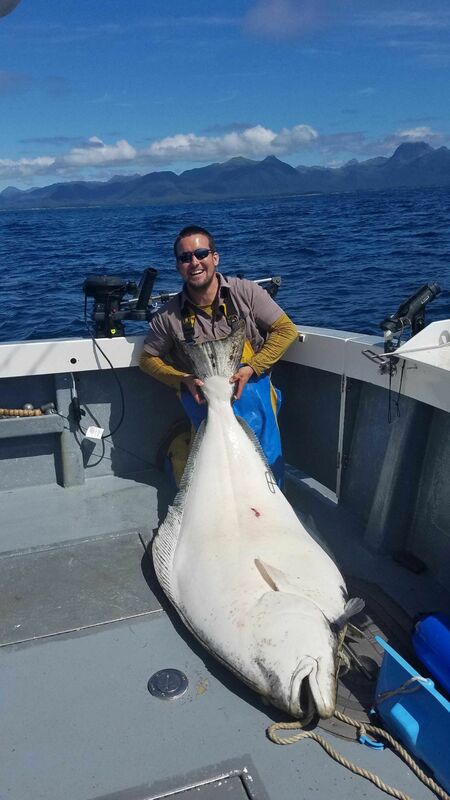 Shane Ring holds up a 180-pound halibut he hooked. Apex Lodge has stunning views as it borders the Lisianski Inlet in Alaska. The Apex Predator is one of two boats Apex Lodge and Charters is constructing for their opening in June. At 24, most are fresh out of college, struggling to find a job, and saving the little money they have to get out of their parents’ guest room. But for Yacolt-native Shane Ring, traversing through oceanic storms and planning the opening of his fishing lodge top the list of his concerns. Ring’s inspiring story started on a sun-baked dock in Parker, Arizona when he was six years old, catching carp with french fries, quesadillas and anything else he could fit on a hook. He found that he particularly enjoyed the challenge of discovering new fish and learning what it took to hook them, so he pursued the hobby by tagging along on fishing trips with his dad and a family friend. He spent weekends enticing brown trout in Bridgeport, California, bobbing for bass in Irvine Lake, California, and eventually reeling up trout by the minute during the mayfly hatch at Merrill Lake. Ring’s thirst for knowledge eventually led him to Alaska, working a summer job as a deckhand for his neighbor’s fishing lodge in Elfin Cove. Spending three, sometimes four, months out of the year reeling halibut, salmon, and rockfish out of Alaska’s frigid waters gave him the opportunity to familiarize himself with the new territory, and after a couple seasons he realized he’d gained the skill to cut out the middleman and become the captain of his own ship. At 19, the youngest age allowed to do so, Ring went out, got his Master Captain’s License and began making a name for himself. It was shortly after Ring’s accomplishment when he met Lohrey, a fellow captain who was running trips out of the Highliner Lodge in Pelican. The relationship was easy, finding camaraderie in their passions and feeding off each other’s skills and experience. Their success on the water and growing clientele was increasing, so with Lohrey’s background in construction and their confidence in guiding fishing trips, it got Lohrey to thinking: what if they just cut out the middleman? Lohrey and Ring began fleshing out the nuances of starting a business and looking around for possible investors, eventually landing an investor who already owned a lodge in Pelican but had the desire to expand the fishing scene in their small town. With their dreams and the money to make them happen, they finally put pen to paper and purchased an undeveloped parcel filled with tall evergreens and overlooking the Lisianski Inlet. The two broke ground in April 2018, first clearing the land of trees and brush and then beginning the arduous task of laying a foundation. The first weeks were spent digging holes, pouring footings and setting posts. In between weather and trips to Juneau, Alaska for supplies, they were able to lay a base for the lodge, build a deck, and get some wall frames put up before the end of May. After a brief hiatus in June to visit with their families back in Washington, Ring, Lohrey, and Lohrey’s son Ephraim Jr. headed back to Pelican and got to work, installing the rest of the walls and laying down a roof by the first week of July. By the end of July, with a roof that was still drying and electrical and windows scheduled to be installed, Ring and Lohrey’s track record on the water already managed to reel in enough reservations to reach 1/3 capacity for the 2019 fishing season. Encouraged by the positive response the small team of three kept up the hard work, installing insulation, sheetrock, lighting, siding, windows, HVAC, and so on. In times of good weather, they took breaks and swapped out work boots for waders, hooking halibut and coho salmon off the coasts of Yakobi Island. When the weather took a downturn in October, pounding their incomplete lodge with hurricane force winds and rain, they took solace in knowing their work was sound by the lack of leaks and cracks when clouds finally cleared. Now a couple months before Apex’s year anniversary, construction is practically complete with walls prepped with texture and floors awaiting installation. All that will be left to do in the months leading up to their soft opening on June 3 is outfitting their lodge to make it into a fisher’s paradise. Their five guest rooms will come with dual twin beds, a full-size bathroom, and wifi. The dining room and lounge in the center of the lodge will offer a comfortable space to relax and regale each other with fishing exploits of the past and present. The lodge also takes full advantage of its beautiful surroundings with large windows and a wrap-around deck, providing a peaceful retreat after an exciting day out on the water. Apex’s two-boat fleet — The Apex Predator and The Bounty — are also awaiting their finishing touches. The Apex Predator was the lodge’s first boat ordered, but after getting enough bookings for their first season, Ring and Lohrey chose to order The Bounty, named after Ring’s moniker Captain Bligh. When completed, the boats will cruise at over 32 mph and feature bathrooms, windows, plenty of seating and a heater to keep cozy in the cool mornings. There’s also a nine-by-nine rear deck that offers plenty of space for a photo opportunity with massive hooked halibuts or rows of rockfish and salmon.